As state Sen. Kel Seliger said last week, the decennial process of drawing the boundaries around legislative districts is inherently political, a fact that’s apparent by looking at the maps themselves. 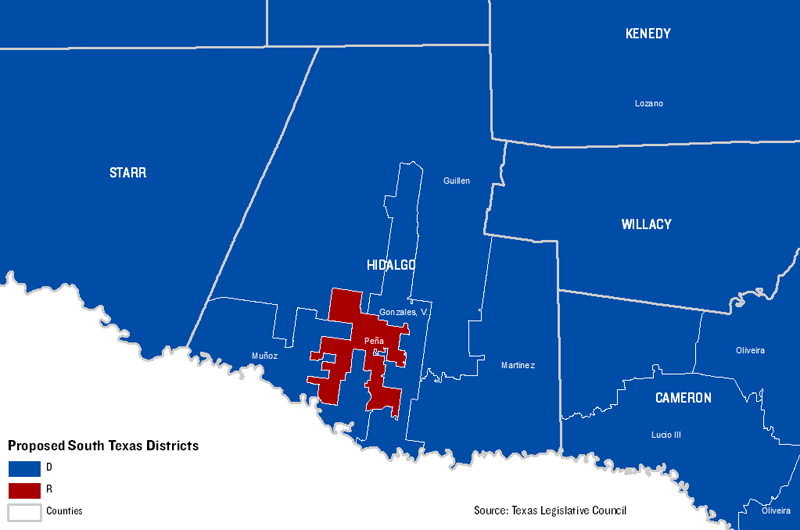 Take the case of state Rep. Aaron Peña, R-Edinburg, who followed his 2010 election as a Democrat last year by switching to the GOP, which now has the largest majority for either party since 1983. 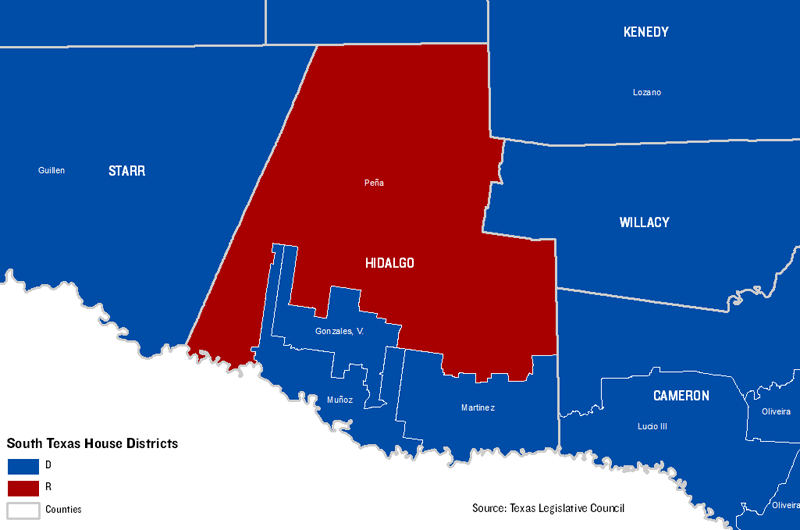 In the statewide map proposed by the House’s redistricting chair, Rep. Burt Solomons, R-Carrollton, Peña’s district is redrawn to boost his chances for re-election as a Republican in Democrat-friendly Hidalgo County. First, this map shows current districts in the Rio Grande Valley. Peña is the lone Republican. Here’s the proposed change. Notice the new district drops the northern, rural and sparsely populated portions of Hidalgo County, and the Sullivan City area in the far southwest corner along the border with Starr County and Mexico. 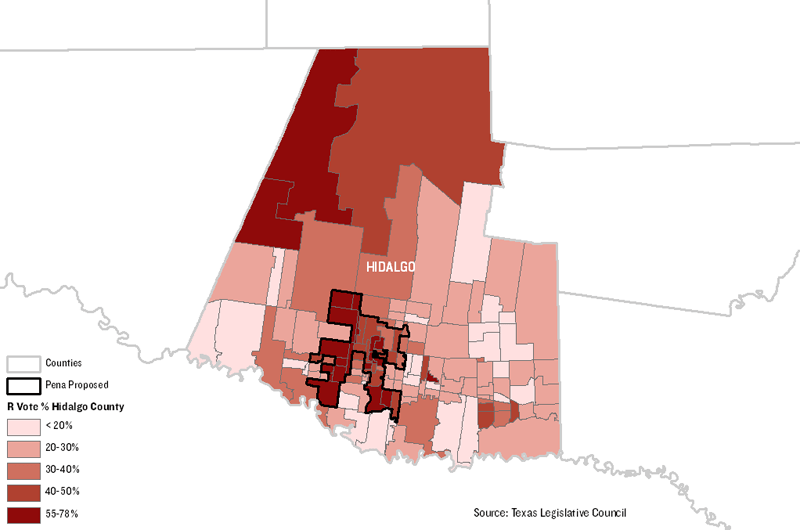 This thematic map shows voting tabulation districts — the U.S. Census Bureau’s version of a precinct — in Hidalgo County, and how they voted in the 2010 governor’s race. Darker shades represent stronger supoort for the Republican in the governor’s race. See how Peña’s proposed district now captures the more Republican-leaning areas. His district is also now changed demographically. The current district is 94 percent Hispanic. The proposed boundaries would lower that to 76 percent. Hidalgo County as a whole is 90 percent Hispanic, according to the census count. Will it work, assuming these boundaries don’t change? We’ll see. In the end, it’s a numbers game. Peña’s current district voted 76 percent for Bill White, the Democrat who lost the governor’s race against Gov. Rick Perry. The governor won the proposed district with 50.1 percent of the vote. Go here to download all the data used to make these maps. Let us know if you have feedback or ideas for other data-related content, and be sure to follow @TribData on Twitter for updates.